A particularly spacious and wonderfully presented four bedroom property. Forming part of Freckenham House, which is a large period residence and was once home to the late Queen mothers lady in waiting. With its captivating history and beautiful grounds, the property is impressive at every step of the way. The property boasts a perfect blend of Edwardian architecture and a wealth of style and high standard design. Further benefitting from gated parking, a double cart-lodge within the grounds, a further two private vehicle spaces adjacent to the front entrance and beautifully manicured gardens that boast entire privacy. 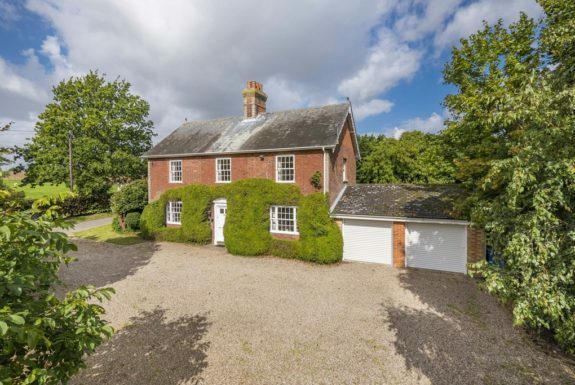 This charming detached country house is surrounded by open countryside. The property has an elegant façade and whilst a degree of updating/modernisation is required the accommodation offers scope for further enlargement. Double garage, parking, garden and paddock. In all about 1.85 acres. A truly stunning and greatly extended four bedroom detached home measuring in excess of 2,600 sq.ft. situated on the outskirts of one of the areas finest villages. Boasting an unparalleled quality of finish, the property enjoys spacious and stylish accommodation throughout including entrance hall, sitting room, kitchen/dining room, family room, snug, cloakroom, family bathroom and four bedrooms, of which the master bedroom and bedroom two enjoy en-suites. Externally benefitting from a paved driveway that provides ample parking beside the double cart lodge. The remaining grounds are mainly lawned with a paved terrace and mature hedging, trees and shrubs to the borders. 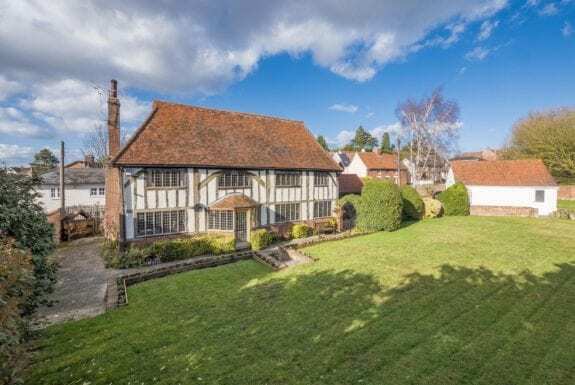 This substantial Grade II Listed 16th Century property is situated on the outskirts of one of the area's most sought after villages backing onto countryside. The property has retained many original period features including decorative carved beams and working fireplace and is currently configured to suit two families or those looking for an annexe, whilst being set within large mature gardens measuring 0.6 of an acre. 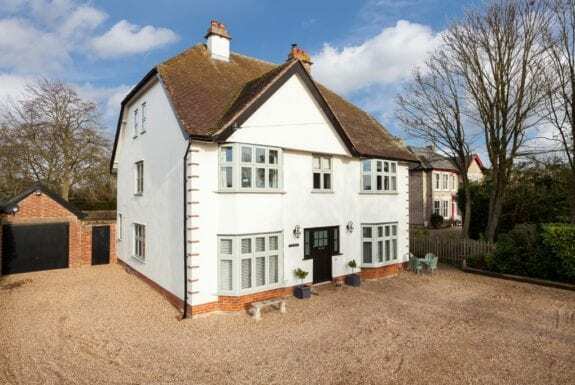 A significant five bedroom (three en-suite) detached property set back from the road and extending to approximately 4,000 sq ft of accommodation including five reception rooms and AGA kitchen/breakfast room. Double garage, gardens and total plot size of approximately 0.65 acres. NO ONWARD CHAIN. 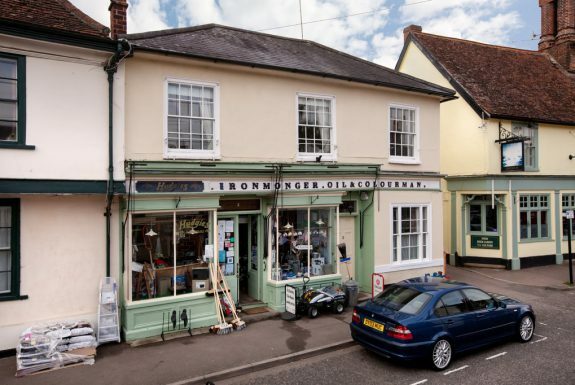 This substantial period commercial building occupies an exceptional position with a prominent façade in one of the areas most highly regarded villages. The property has considerable versatility that includes ground floor commercial space and is complimented by a spacious residential area. Further benefits include a large South-West facing garden and off road parking. An impressive detached barn conversion requiring finishing that measures approximately 6000 sq ft in this highly desirable Suffolk area and enjoys wonderful far reaching countryside views to the rear. An impressive Grade II Listed detached thatched farmhouse having a wealth of period features and enjoying idyllic grounds of approximately 0.75 acres. A newly constructed and individually finished six double bedroom detached property situated in one of the areas most picturesque villages. Completed to a fantastic standard, the property enjoys spacious and modern accommodation throughout spread across three floors. Externally benefitting from driveway parking beside the double carport and sizeable front and rear gardens. A particular asset to the property is the spectacular undulant views across open countryside. 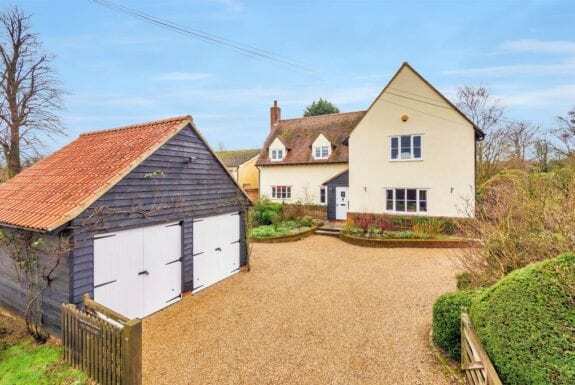 This substantial detached house occupies an exceptional position in the heart of one of East Anglias most highly regarded villages. The property is ideally placed for the village amenities in one direction and countryside walks in the other, further benefits include a large studio, double garage and generous South-West facing garden. 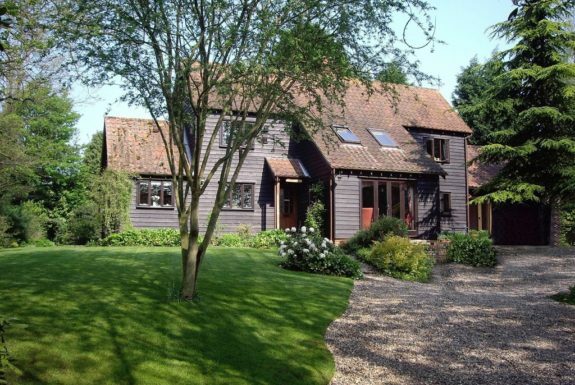 No onward chain - A four bedroom (two en-suite) detached property constructed in 2010, enjoying a total internal floor area of approximately 2,000 sq ft.Benefits include a carriage house with an integral office, parking, gardens and meadow to rear with a total plot size of approximately 1.8 acres. A detached barn style conversion set back in wonderful mature grounds in a popular and well served village. An outstanding and impeccably presented detached property set within large private mature grounds offering lavishly appointed family accommodation. 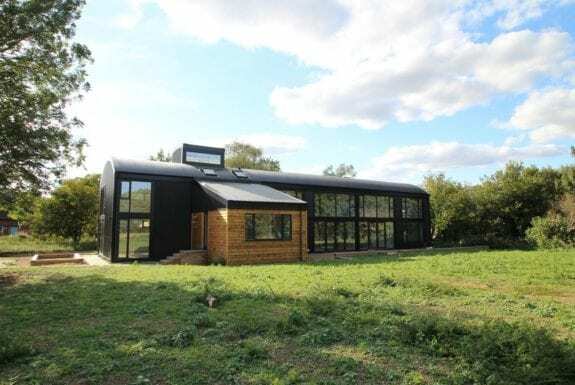 Integral garage, detached barn, office and an in and out carriage drive. In all about 1.0 acre sts. This elegant four bedroom (one en-suite) Grade II listed residence, with annex/ancillary accommodation, blends both period and contemporary features with total accommodation of approximately 2,800 sq ft. Benefits include a carport, versatile outbuildings and total plot of approximately 0.25 acres. This substantial period house occupies an exceptional position in the heart of a highly regarded village ideally placed for amenities. The property offers considerable versatility and lends itself to a range of uses, has exceptional character throughout and is further complimented by a large walled garden. This attractive Edwardian detached property is situated on the outskirts of the village convenient for local amenities. The property offers elegant period features including decorative cornicing, period fireplaces and high ceilings, complemented by modern bathrooms and a bespoke handmade kitchen, plenty of parking and a single garage. 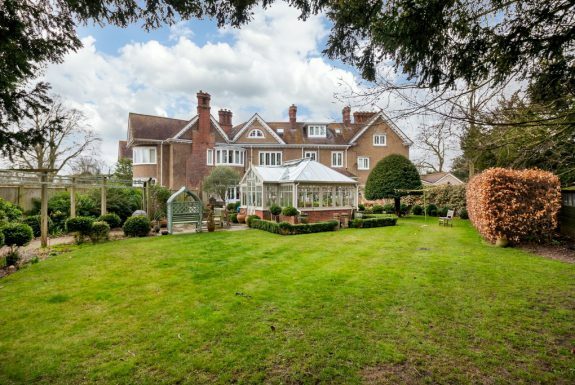 The property sits within large mature gardens measuring 0.3 of an acre. This attractive Grade II Listed farmhouse is situated in a quiet rural location enjoying views over open countryside. The property, which would benefit from a degree of modernisation, offers well-proportioned living accommodation with the potential for further enlargement (subject to the necessary planning consents) and sits within large mature gardens incorporating a useful detached barn with further land available by separate negotiation. In all about 1.38 acres. This substantial detached barn conversion sits in a quiet, rural location enjoying far reaching views over undulating countryside. 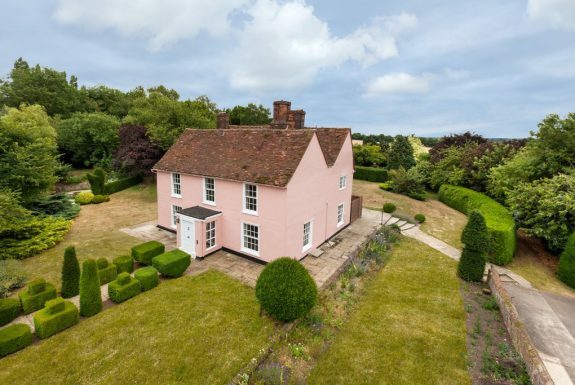 The property offers a wealth of original period features with timber frame complemented by high quality modern finishes including a bespoke kitchen and stylish bathrooms with the added benefit of a detached office/studio and cart lodge and planning permission for further living accommodation. In all about 0.55 of an acres. Offered in excellent condition and standing in an enviable position at the end of a private road is this stylish and well-proportioned 4 bedroom detached bungalow within easy reach of the town centre. Having undergone regular updates and refurbishment by the current owners during their custody, the property now offers generous and free-flowing single storey living accommodation, having benefitted from the addition of a delightful kitchen/dining room as well as a garage. Further benefits include ample off road parking, private south facing rear gardens and the added benefit of no onward chain. 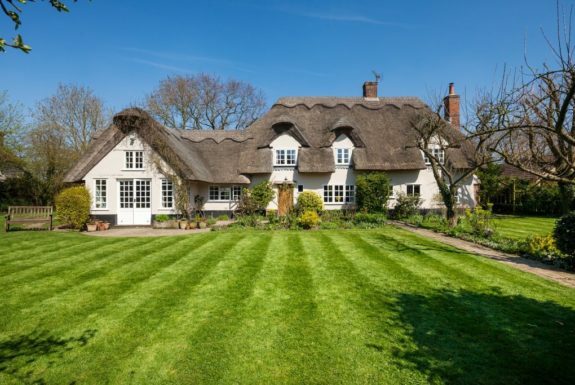 Lane House is a breathtakingly beautiful Grade II Listed four bedroom detached thatched cottage nestled within one of the areas most sought after villages. The property is situated on a no through road with footpaths leading to open countryside. The property boasts sizeable and well-proportioned accommodation throughout as well as enjoying period character with exposed beams and stunning inglenook fireplaces. The grounds measure approximately 0.3 acres and further benefit from off street parking, a detached double garage and glorious wrap-around gardens. A substantial 2,800 sq. 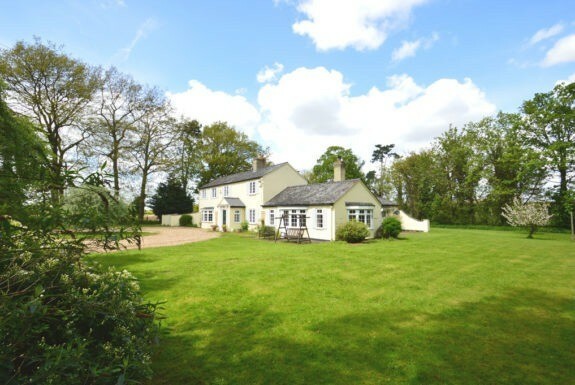 ft. detached property situated in a quiet, tucked away location surrounded by open countryside. 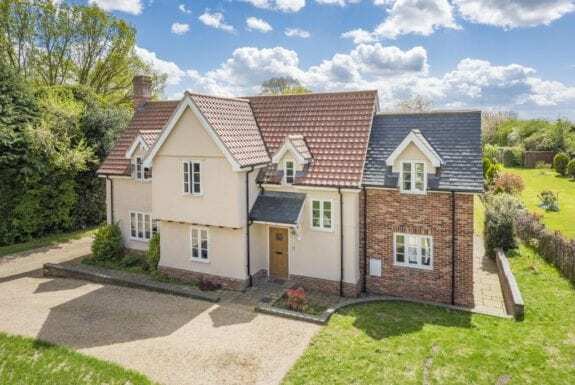 The property offers a spacious and flexible layout with the potential for a self-contained annexe and sits within large, mature gardens backing onto open countryside and surrounding woodland. In all measuring 0.72 of an acre. A substantial and individual detached property enjoying a superb village location offering exceptionally spacious and versatile family accommodation including impressive reception rooms and five bedrooms. Large mature South facing gardens with views, detached double garage and ample parking. An unlisted four bedroom (one en-suite) period conversion offering accommodation in the region of 2,390 sq ft . The 28ft triple aspect sitting/dining room provides an outstanding reception space. Double garage, parking, well-screened gardens with total plot size of approximately 0.2 acres.